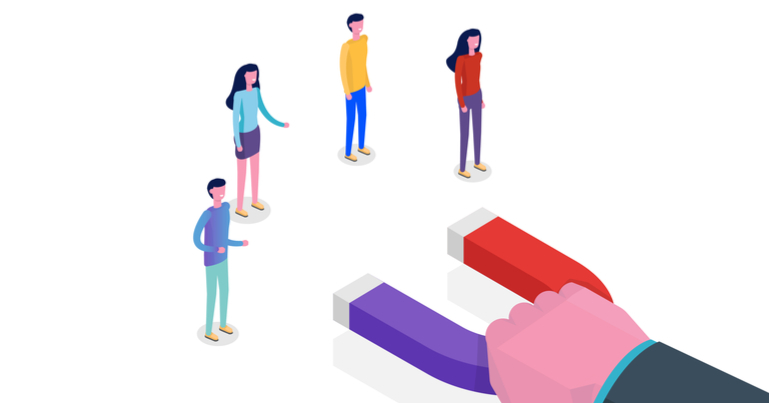 Whether you are an owner-operator or a digital marketer with a demanding client list, you will have learned this lesson by now: generating leads can be one of the hardest things to do on the web today. In other words: how do we capture someone’s attention and quickly turn that attention into curiosity? You are creating gated content, right? Right? A cornerstone of inbound marketing is to create value for your prospects before you start asking for their hard-earned money. That could mean something as simple as writing a blog, but a great way to provide value and simultaneously create leads is through gated content. Psst! Gated content is content your prospect unlocks by saying the magic words… Not abracadabra, but their personal information. Spend some time creating e-books, case studies, training courses, cheat sheets, spreadsheets, templates, or whatever suits your industry the best. Allow your prospects access for free in exchange for their email addresses, and voilà: your prospects got great value, and you just got a new lead! More than just a tool for driving traffic and increasing brand awareness, social media can also be used for lead generation. Yes, you should always be sharing your content on social media, but you can also share your landing pages directly. 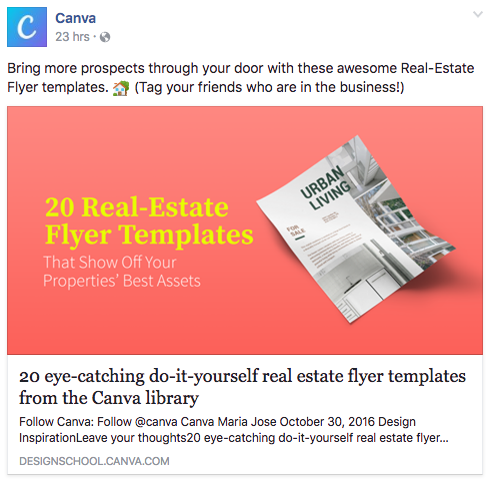 Case in point: this post by Canva. Via Moz. Yes, it can really be that simple. Those who are interested will click the link and either become a lead or will be able to be retargeted to later on. Very simple, very quick, and very effective! “Content is the new currency” is a popular adage in marketing circles, and they are right: creating content is more important now than ever before. Not only will your blog allow you to answer prospects’ questions, establish you as an expert in your industry, and drive traffic to your website through search engines, but it can also generate leads. Writing a good blog post is nice and all, but what does a reader see when they finish reading? If you just said “the footer of my website” instead of “a call to action”, please pay attention. The prospect is right there, on your website! You need to give them an opportunity to engage themselves further. Put a call to action at the end of every blog post. It could be an invitation to like you on Facebook or follow you on Instagram. Link them to a relevant e-book or case study you’ve written. Make them aware of an upcoming webinar. You have to do something. Just letting the visitor leave without at least asking if they want to see more from your company is an easy mistake to avoid. End-of-blog calls to action, like we discuss above, can often look like random advertisements. If a visitor assumes that it is an unrelated ad, they won’t even bother looking at it. You just lost a potential lead. This is called banner blindness, and it is a serious challenge on the web today. Counteract banner blindness by adding “anchor text” calls to action. Anchor text CTAs is simply a text link that is styled as a header to make it stand out from the rest of the article’s copy. 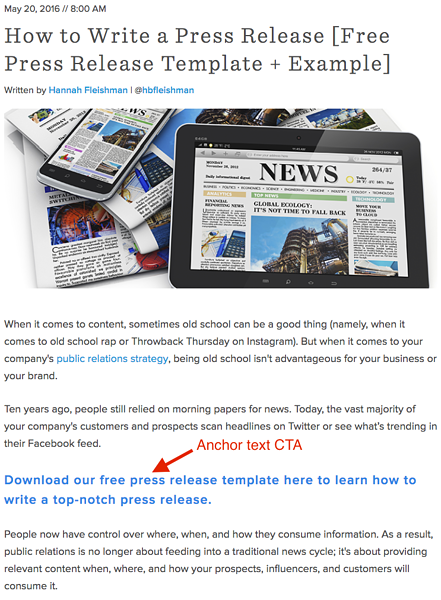 In an audit HubSpot did of its own blog’s lead generation, anchor text CTAs accounted for up to 93% of leads. Here's how HubSpot sneaks in their anchor text Calls to action: between two of the introductory paragraphs. It’s also likely that a CTA earlier than the very end of an article will be seen by more people, and it could lead them to the answer they are looking for quicker than an end-of-blog CTA. So you’ve attracted a prospect to your website, they have read your blog, found a call to action and clicked on it. Now they’re taken to a landing page with a relevant lead magnet on it. You are standing at the finish line, but things can still go wrong at this point. Optimise your opt-in forms by only asking for the bare minimum of information: an email address and a name. You could even leave out the latter. We understand that you’ll get more qualified leads the more information you receive upfront, but you could do that work through email later.